The Gold Rush is on, not out west but in 1860s New Zealand, and a young marriage is one of its casualties in this gripping pioneer story from the greatly gifted Tremain (Music and Silence, 2000, etc.). Few emigrants have wanted to start over as ardently as Joseph Blackstone, who is fleeing two deaths in his native England. His father died in a horrible freak accident, his sweetheart in a different accident, for which Joseph feels (rightly) profound guilt. He has brought to the South Island his mother Lilian (no woman is more important) and his bride Harriet, a former governess. Harriet is the ideal pioneer, “a woman who longed for the unfamiliar” and for tests of her strength. Joseph has bought land and built a primitive house. The three scurry like ants under a vast sky, plains before them, fearsome mountains behind—until Joseph finds traces of gold beside their creek. The gold seduces him. It becomes his secret love. Clever Harriet figures this out, though, and, on top of his selfishness, this secrecy dooms her love for him. Soon, Joseph joins the Rush (far away from his property), marks out his claim, sinks his shafts. Anything for the colour! (A teenage hustler makes his nights less lonely.) Tremain does a fine job exploring the culture of the Rush: the noise, the stink, the thrill of the “homeward bounder.” Meanwhile, the elements have destroyed his house, and Lilian has died trying to save it. Harriet rejoins him, without tenderness, and sets up her own camp. 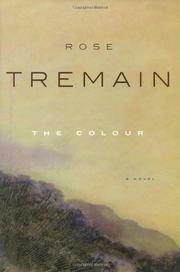 True to form, Tremain doesn’t confine herself to the white settler’s viewpoint: other important characters include a Maori woman guided by the spirit world, and a Chinese market gardener who will play a crucial plot role and experience a transformation. Transformations, indeed, abound in this brittle world where everything is possible and yet everything is at risk. The result is a page-turner that’s also a work of startling beauty.